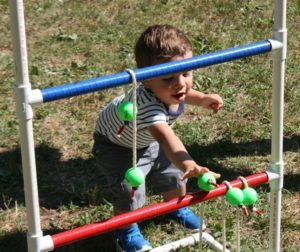 A morning monsoon did nothing to dampen the spirits of picnic-goers at the second annual Lehigh Presbytery Picnic on July 15, 2018 at the Emmaus Community Park. “Considering that at 10 a.m. it was like Armageddon, I’d say we had a great turnout,” said event organizer Sally Heimbach. “We just thought about Noah,” joked Jane Koeble. 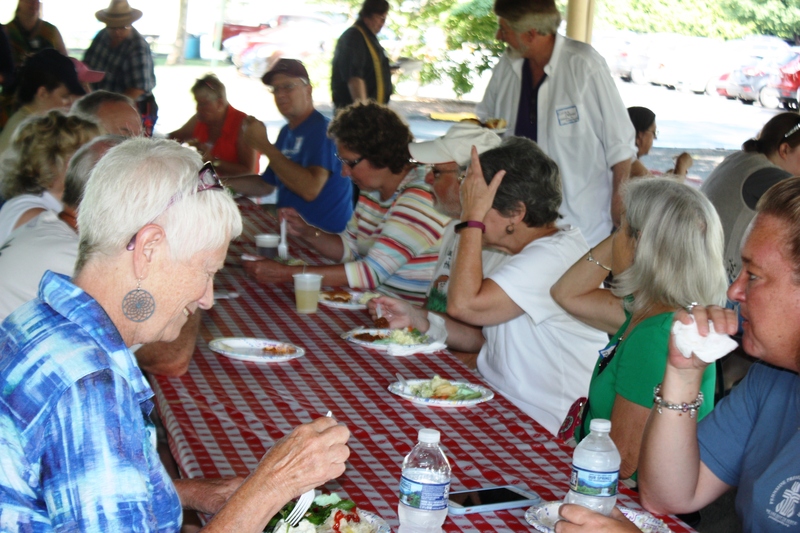 While heavy rains fell on much of the area in the morning, by the time the picnic started the sun was out and spirit were high as everyone dug into hotdogs and barbecue provided by the Presbytery, and a variety of dishes brought by attendees. 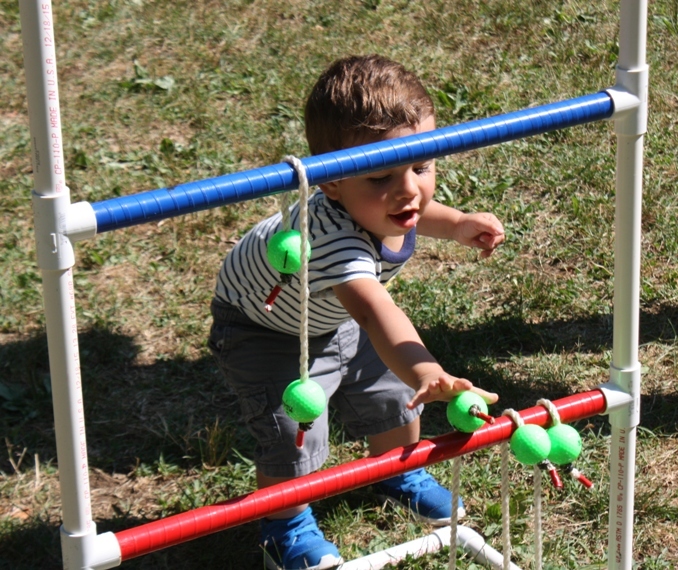 Children’s games and crafts were set up for families to enjoy, while others sat in the shade and chatted with friends. People from churches throughout the Presbytery attended, fresh from worship and having changed from their church clothes into picnic gear. Janine Santoro, a member of the Allentown church, came with her husband Steve and their toddler son, Joey. The Summerton, South Carolina community was damaged by flooding in 2015 and then again in 2016 by Hurricane Matthew. Strong winds and rain from the hurricane just added to the devastation caused by the previous year’s floods. The Summerton Presbyterian Church worked with the Presbyterian Disaster Assistance Program to bring volunteers to their are to help with the recovery and rebuilding efforts. The Helping Hands Volunteers of Lehigh Presbytery were part of this effort and made their second trip to Summerton on April 14-21, 2018. On this trip volunteers were tasked with working on two houses. 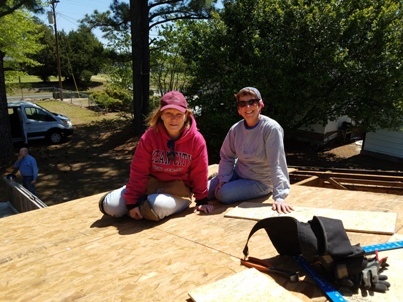 A small group of volunteers made short work of their assignments on the first house and finished up on Monday. Later in the week a small group went back to clean up the house so the homeowners could move back in. A job well done! The majority of the volunteers worked on the second house which had a more extensive list of tasks to complete. A few headed to the roof where they removed shingles on one half of the roof, replaced the plywood sheathing, installed new tar paper and shingles, and attached the aluminum flashing. Another group of volunteers were inside the house where they removed a rotting sub-floor and one rotted floor joist in one room. They then installed a new floor joist and laid down a new sub-floor. What came next was to install underlayment and laminate flooring in a few rooms. Others were busy removing and installing insulation and sheetrock in a room. They applied a coat of joint compound to the ceiling and wall and installed some freshly painted moldings. A new back stoop was constructed and installed with steps and railings. After a long week of labors, the volunteers were able to have some down time to enjoy a pontoon boat ride around a swamp in the area. The swamp they toured was formed by damming the Santee River. The swamp is part of Lake Marion (which is named after the Swamp Fox of the Revolutionary War–Francis Marion). It was a beautiful sight to behold. There were large Cypress trees, alligators, cormorants, ospreys and many other interesting and often beautiful things. The volunteers are grateful for the prayers and support from Lehigh Presbytery. They were able to accomplish a lot of work in a short amount of time. This was all made possible by your generous donations and the tireless time and dedication of our Helping Hands Care Team and Volunteers. Wouldn’t you like to be part of this mission/ministry? We invite you to become a member of the Helping Hands Care Team to help plan and coordinate these mission trips; or join us as a volunteer by sharing your time and talents; or you can help by sending a donation to further this mission to help those in need! If you feel you don’t have the skills to volunteer, you may be wrong…..we have members on the team that can teach you the skills you need. It is not as hard as you think! You generous donations go a long way to give out “helping hands” the ability to reach out to others in need. They have met so many people and have given them renewed hope. Thank you! 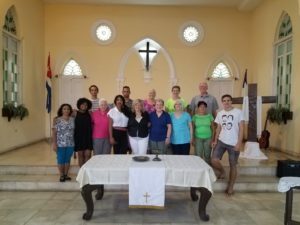 The Presbyterian Church of the Mountain (PCOM), with the help of a grant from the Lehigh Presbytery and the Synod of the Trinity, sent a mission team comprised of eight parishioners to Cardenas, Cuba, from May 8 to May 15, 2018. This was the eighth mission trip since 1998 that the PCOM has sent to Cardenas. The team carried with them more than $40,000 worth of medicines that they donated to their sister church in Cardenas, the Juan G. Hall Reformed Presbyterian Church. The mission began in 1998 when the PCOM decided to donate medicines to Cuba after learning of the shortages there created by the U.S. embargo. A three-member mission team carried medicines, obtained from MAP International, to a church they learned about from a local pastor who had recently visited there. The personal and spiritual relationships that were created during the first visit have grown stronger over the past twenty years. In addition to return to Cardenas seven times since the, the PCOM has brought Cubans to visit the Water Gap church on two occasions. Pastor Alison Infante Zamora of the Juan G. Hall Church visited the PCOM in the summer of 2017. In addition to approximately $39,000 worth of medicines obtained from MAP International, the 2018 mission team took additional medicines donated by the PCOM congregation and a local physician. They gave those medicines to the church in Cardenas, where two members of the congregation who are physicians will oversee their distribution to local residents. While the team was in Cardenas, they participated in the weekly activities of the church. Cardenas is a city of 120,000 people. Some elderly parishioners struggle to make it to church on Sunday morning, so smaller worship communities, called Pastorals, meet weekly to serve them. 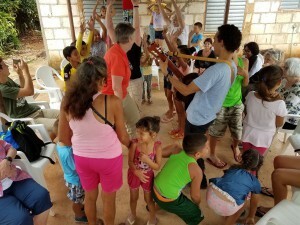 Members of the mission team participated in these worship activities in homes throughout the city. Team members also visited and dined with parishioners in their homes. One of the team members was the pastor of the PCOM, the Rev. Sherry Blackman. Pastor Blackman took a prominent role in the mission, offering multiple prayers and giving the sermon at the Sunday morning church service. Of the eight team members, four are musicians. Individually and together with Cuban musicians they contributed to the rich musical component of the trip through their performances. 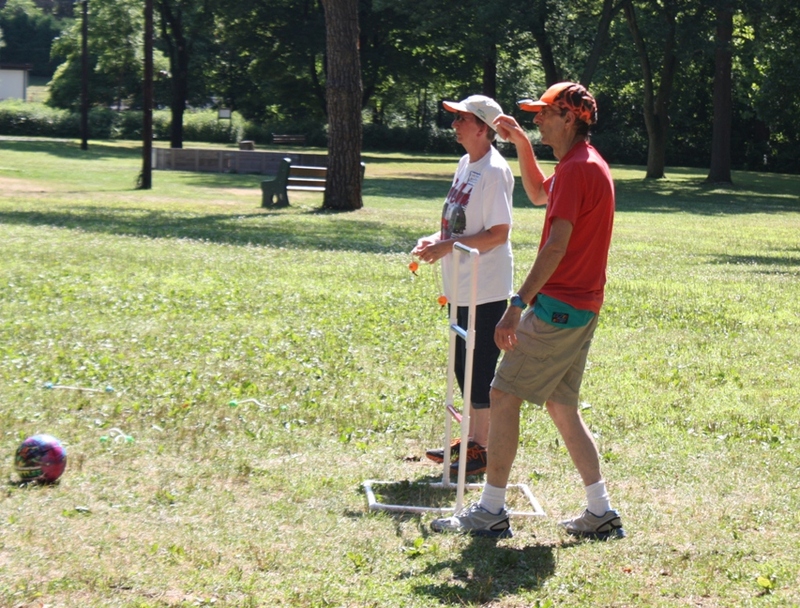 Other team members contributed in their own unique way to the success of the trip. Through daily contact with the Juan G. Hall congregation in their homes and in the church, team members learned of the hardships and challenges faced by Cubans on a daily basis. While the Cuban government offers excellent, and free, medical care, medicines, medical supplies, and medical equipment reman difficult to get. Perhaps the most sobering reality for Cubans is the lack of opportunity for young people. There are friends, who, because of Cuba’s free higher education, have degrees in engineering and other professional fields, yet who work in the tourism industry because doing so gives them access to foreign currency through tips. Hope is in short supply. Yet the members of the Juan G. Hall Church in Cardenas maintain a positive and happy attitude. Of the lessons learned on this trip–perhaps the most important–was that material wealth is not a prerequisite for happiness. 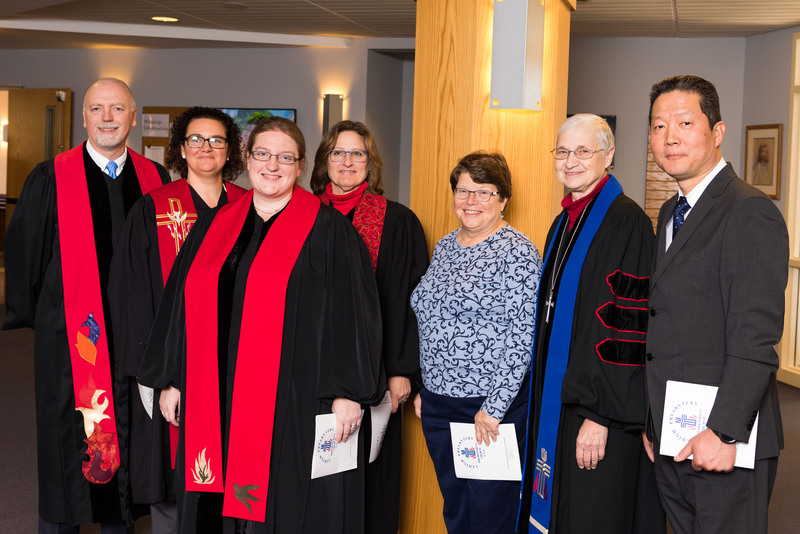 On March 18, 2018, a beautiful, non-snowy Sunday afternoon, Lehigh Presbytery held the installation service for the Rev. Rebecca Sue Mallozzi as the pastor of the Faith Presbyterian Church in Emmaus. Family, friends, members of the congregation and the Presbytery gathered to celebrate this special day. 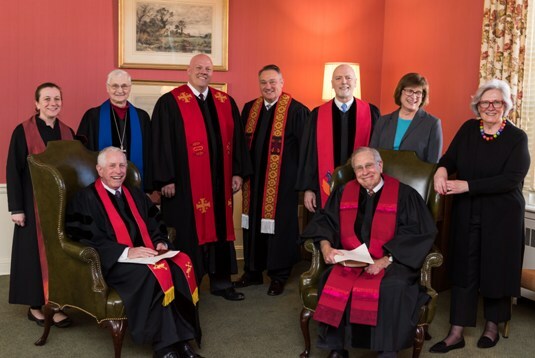 Members of the Administrative Commission (pictured) are the Rev. Stephen Emich, Rev. Stefanie Muntzel, Rev. Sue Marie Baskette, Elder Sally Heimbach, Rev. Carol Brown (Moderator of Lehigh Presbytery), and Elder Suk Won Lee. Rev. Rebecca Mallozzi is also pictured. Following a welcome by Elder Sally Heimbach, as both a representative of the Presbytery and the chairperson of the PNC that called Rev. Mallozzi, they entered into the service that featured a special hymn by the Faith Presbyterian Church Adult Choir and their organist Brian Snyder. The homily was given by the Rev. Stephen McKinney-Whitaker, the pastor of Derry Presbyterian Church in Hershey, PA. Stephen and Rebecca were colleagues in their previous pastorates in Illinois and found them both headed to Pennsylvania for the next step in their ministries. Rebecca had given the homily at his installation in Hershey. Rev. Rebecca Mallozzi and Rev. Stephen McKinney-Whitaker processing out after the service. Rev. Carol Brown, Moderator of Lehigh Presbytery, presided over the installation. Elder Lynn Ingram, Clerk of Session of Faith Presbyterian Church, presented Rev. Mallozzi with a gift from the congregation. The Women of Faith had fashioned a quilted stole, made from scraps of material inspired by one of her recent sermons. This was especially meaningful, since Rebecca is a quilter herself. Following the service, all were encouraged to stay for a reception hosted by the members of a very happy and joyous congregation! 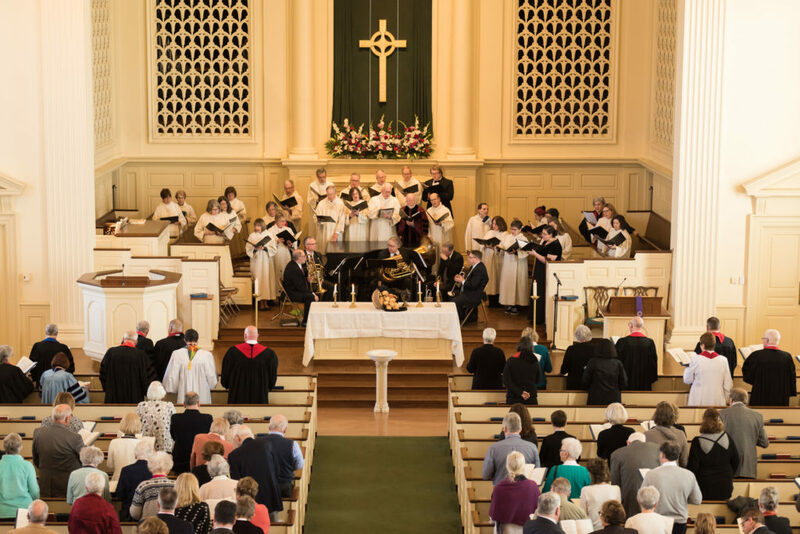 Hundreds filled the sanctuary on Sunday, March 4, 2018, as more than 35 clergy processed to begin the installation service of the Rev. J. C. Austin as pastor of the First Presbyterian Church of Bethlehem. The afternoon was filled with smiles and tears of joy as members and friends celebrated a new beginning for this historic congregation. A special guest from Louisville, Kentucky, Laurie Griffith from the Office of the General Assembly, PCUSA, was in attendance. The Rev. Dr. Tom Tewell, founder of the Macedonian Ministries, Atlanta, Georgia, delivered the sermon “Balcony People”, reminding each of us about the quiet saints, role models and mentors who have affected our lives. Rev. 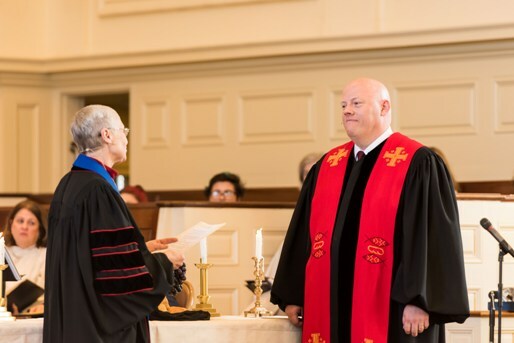 Carol Brown, Moderator of Lehigh Presbytery, installed the Rev. J. C. Austin as pastor. Other participants included the Rev. Stephen Emick, the Rev. Susan Tindall, the Rev. Keith Brown, the Rev. Carol Brown, Elder Susan Farber, the Rev. Dave Duquette, Elder Joanne Kelhart, and Elder Marsha Heimann. Alexander “Pat” Dyer presented the congregation’s gift to J.C., a set of stoles. J.C. was also presented with Rev. Dr. Lloyd Ogilvie’s most recent book, signed by Dr. Ogilvie with a special message. Special music was provided by the Chancel Choir, under the direction of David Macbeth and the Hill to Hill Brass Quintet. Seated in chairs: Rev. Tom Tewell, Rev. Keith Brown. Back row: Rev. Susan Tindall, Rev. Carol Brown, Rev. J.C. Austin, Rev. Dave Duquette, Rev. Stephen Emick, Elder Joanne Kelhart, and Elder Marsha Heimann. You can read more about J.C. and his installation on the Synod of the Trinity website under featured news.